In Gain, you can create and schedule posts for Instagram accounts, including album posts of up 10 images, videos, and animated GIFs. In this article, we will go over everything you need to know to post on your Instagram accounts. To create new content, first, make sure your account(s) has been connected successfully. You will know it’s connected because it will show up under Channels in the Filters panel. Then, click on the +New Content button or hover over the date in the calendar and click on the New Content icon. All content created for Instagram on Gain requires manual intervention to publish. This is because the new automated Instagram publishing API only supports single-photo posts. It does not support video posts, multi-photo posts, or even hashtags in captions. It is very limited and in closed beta testing, so at this time we will not be supporting this type of publishing. However, we'll continue to review this functionality and add it as soon as these features are improved. Gain allows you to upload MP4 or MOV files, JPG, PNG and GIF images to Instagram. Image file limit is 5MB. Video files can be up to 600MB in size and 3 to 60 seconds in duration. The video duration has a hard limit and videos that are even a fraction of a second over the time limit cannot be uploaded. For best results, upload an MP4 or MOV video file. Character limitation for post copy is 2200. In Gain’s post editor, you can choose from several different post types. We will go over each one below. In Gain, you can create single photo posts or Instagram Albums of up to ten images. In the Photo tab, after you upload photos, they will appear in the All Images tab. This works much like a queue where you can save multiple photos even if not all of them will be published. The final photos that will be published will be at the top and in the preview. You can delete the photos to be published by clicking on the [X] on the top right, and the image will disappear from the preview. To add another image or the same one again, just click on the image in the All Images queue. Gain also includes a full-featured image editor where you can crop, resize, add text, enhance and add effects to your images. To edit your image, hover over your final image and click the “🖌️” icon. To create Instagram video posts, simply drag and drop your video. Keep in mind that the maximum video length is 60 seconds. You’ll be able to add a filter, edit the caption, and add your location in the Instagram app before sharing it. Gain allows you to upload any GIF and will automatically turn the GIF into a video file. Simply drag and drop your animated GIFs and click Save. 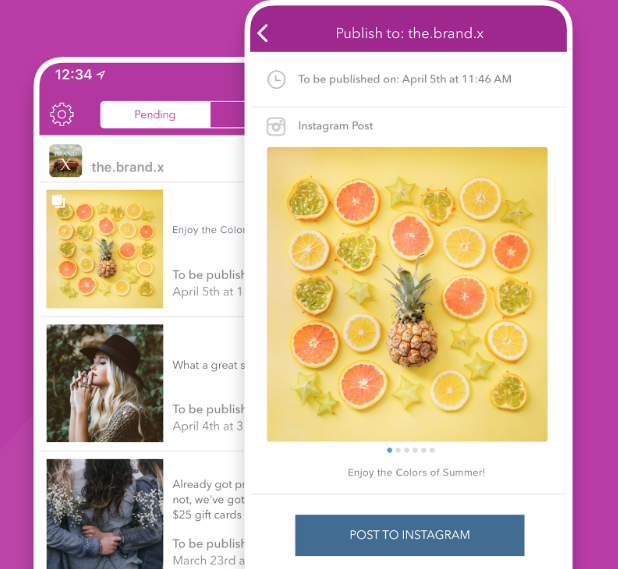 After the designated manual publisher receives the push notification from Gain Notify, the publisher must paste the post's caption onto the Instagram app. Gain Notify respects the original formatting that was created when the post was first scheduled inside the Gain app, including paragraph spaces. However, Instagram won't allow multiple line breaks in a row (i.e. leaving one or more blank lines in your captions). This only seems to happen when users view the post in the Instagram mobile app. Posts on the web show paragraph breaks (even when using many blank lines). Some users use a trick to separate paragraphs by putting a single period at the beginning of each blank line. Additionally, under certain circumstances, Instagram may remove the line breaks altogether. Please note, formatting is controlled on Instagram's side and Gain can only reflect it in the previews, not modify it in any way. For more information on using Instagram, please visit their Help Center here. Since posting to Instagram requires manual intervention to publish, you have to select a manual publisher first. This person is in charge of receiving the reminders when it's time to post, and it can be you or anyone on your team in charge of publishing content. In the Social Channels section of your People, Workflow, Settings menu, you can designate the manual publisher. Choose the Instagram channel and then select a user from the dropdown list. The manual publisher will have to download Gain Notify so they can receive the reminders and publish content from their mobile devices. The Gain Notify app is available to download on Android and iOS. To download the app, go to the App Store and type Gain Notify. If you download Gain Notify on your iPad, make sure to search for apps that are "only for iPhones" to find it. Log in using your Gain credentials. Note: Gain Notify supports 1Password manager to log in to the app. After you're signed-in, allow Gain Notify push notifications, otherwise, you will not be notified when new content is ready to be published. Download the Gain Notify app from the Google Play Store. After you're signed-in, allow Gain Notify push notifications, otherwise, you will not be notified when new content is ready to be published. Then, Gain will want to confirm again, so select Allow. Once you have established the manual publisher and the app is installed, when it's time to post, a push notification will be sent to the manual publisher. Any images will be saved to your camera roll. When Instagram opens up, you have to go to your Library to select the images. The caption for your post is copied to the clipboard so that you can tap and hold to paste it into the Instagram caption field. Important: an Instagram post will not show up on the Gain Notify app until it's time to publish the post, per the publish date you set. So, a post is scheduled for tomorrow at 10 am, it will only show up on the Gain Notify app at that hour and not before. If there are no posts ready to publish, then the Pending tab will read: "No posts ready to publish. Log in to your Gain account and get notifications when there's Instagram content to publish." When content is available, the posts can be found on this tab waiting to be manually posted. The Posted tab will include all the content that you've already posted to Instagram. If a post appears within the Gain Notify app, it does not mean it has been published, it simply means it was sent to Gain Notify at the scheduled date/time. If a post you've already posted shows up in the Pending tab, then you can remove it by tapping I Already Published This.